Photos of Cannon Beach - a city along the Oregon Coast that stretches between the magnificent Pacific Ocean and luscious forest. Cannon Beach offers photographers a paradise of Haystack Rock photos, sunset pictures and beach images. Cannon Beach photos are iconic of the Oregon Coast with Haystack Rock towering above the beach. Visit CannonBeachPhoto.com for more incredible images of Cannon Beach, Oregon. 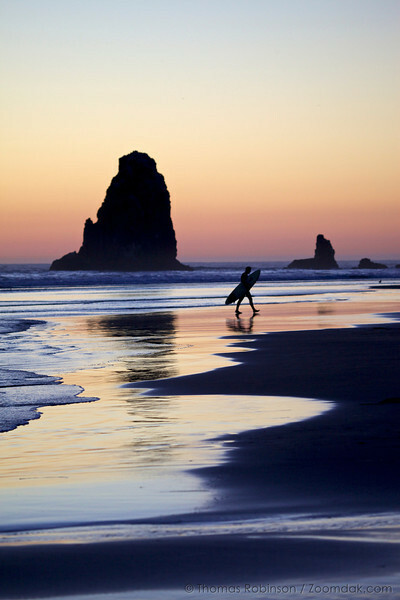 A surfer strolls back up the beach after a surf session at the needles in Cannon Beach, Oregon.